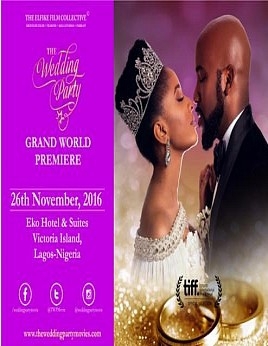 THE WEDDING PARTY received a rapturous response at its World Premiere on the opening night of the Toronto International Film Festival. The prestigious Elgin Theatre was sold out, with an audience of over 1,400 guests, including cast members Richard Mofe-Damijo, Sola Sobowale, Ali Baba, Iretiola Doyle, Banky W and Adesua Etomi. This follows hot on the heels of the phenomenal success of Fifty, our debut feature and the most successful film at the Nigerian box-office in 2015. Fifty was the only Nigerian film, and one of only five African films from a global selection of 238 films, selected to screen at the 59th BFI London Film Festival. We would truly appreciate your support of THE WEDDING PARTY and we would be honoured to have you, your family, clients and friends as our special guests at what promises to be an unforgettable night. We look forward to your earnest revert.